Details: The Ford Transit van used by the Hounslow Garage engineers was withdrawn in spring 2018, presumably following accident or mechanical damage. It was replaced by a series of unmarked silver vans, presumably hired. First up was MK18YPT, replaced by similar CX18PNO in July, which was in turn replaced by MV68XBD in September. 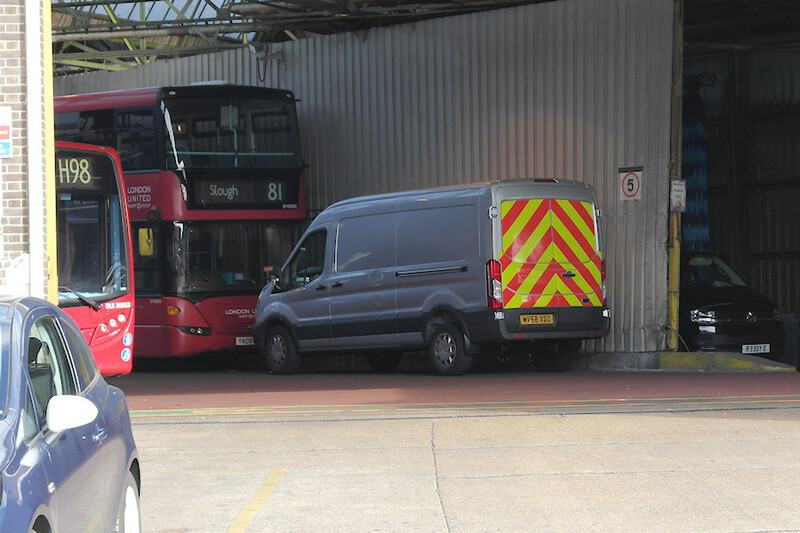 The latest incumbent was photographed inside the garage on 26th September 2018, showing that it has been given rear chevrons. Whether this means it will stay any longer than the other two remains to be seen! Note also the black VW Transporter van parked in the bus wash. This is not thought to be a service vehicle but it does have an interesting registration of R33DY E.